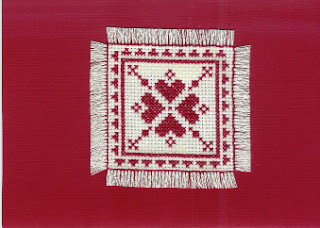 Another motif from Red Threads by Rosewood Manor. 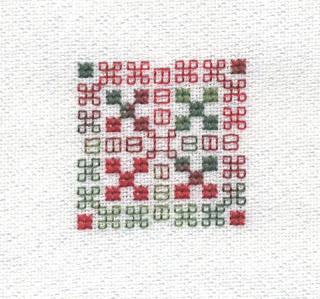 I think this is my favorite ornament of the motifs I've stitched. 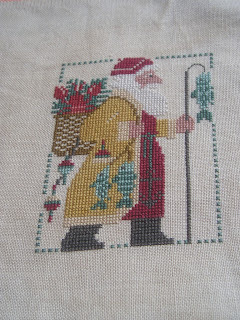 And yes, you can expect another one of these little darlings from me next month if I manage some stitching time. My June ornie/card! 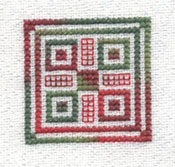 I found this motif in a book called "Traditional Needle Arts Cross Stitch" by Katrin Cargill and stitched it on a mystery 14 count Aida with DMC 304 before gluing it onto a card stock that I had left over from my Christmas 2006 cards. I'm pretty sure I last posted in April and I have been working on an ornament (or two), they just took me longer than expected to finish, so finally here they are in all their blurry glory ( I just can't seem to take good photos). I really like this ornament because it's a bit quirky, I changed the colours to DMC threads and even though it's not as nice as the original I think turned out OK. 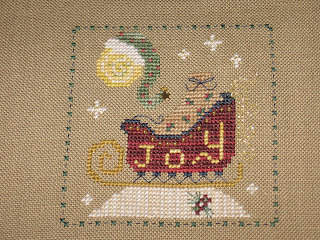 This is the one that took so long, I've only done one other of these kits and this one had lots more beads, it seemed to go on forever! It's so much more sparkling IRL than in the photo, I wish I could capture it. Next weekend is our June SAL weekend. I hope you'll all be stitching away because the weekend of 6-8 July is going to be a finishing weekend! We will be finishing along with the Focus on Finishing blog. Please pop over and have a look at - there are some great tips on there for finishing ideas. As an added incentive, there will be a draw with a prize! 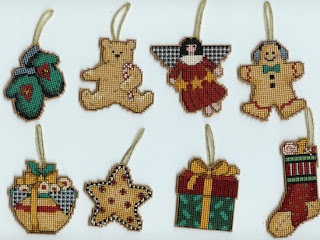 Everyone who finishes an ornament that weekend and posts it to the Finishing blog will be entered into a draw for some Christmas finishing supplies. You'll have to be a member of the Finishing blog to post, so if you think you'll be playing along please have a look on that blog to see how to join. This is a SB kit I made this little bag for gift Christmas friend. 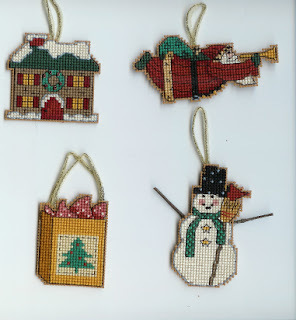 A Debbie Mumm kit for Dimensions called Christmas Adornments. 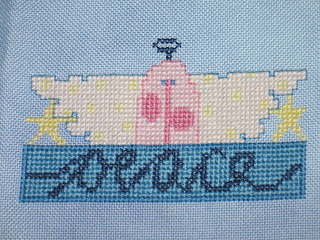 I did not get much stitching done on the actual SAL weekend and once I did get some stitching done, I decided to just get it done because I can not stand having unfinished projects laying about. My rule of thumb is one project at a time. 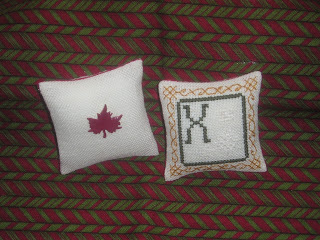 I've stitched ornaments on the SAL weekends in both April and May but I haven't had time to post them. 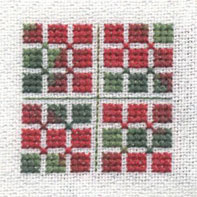 I'm using motifs from Rosewood Manor's Red Threads Chart using 28 count white opalescent fabric and Waterlilies in Holiday. May's ornie is to the right. With a newborn in the house, I can only manage to stitch one tiny ornament each month, but I don't really mind (the snuggle time is well worth it). I will be stitching from this chart for the next few SAL's. I think they look festive. 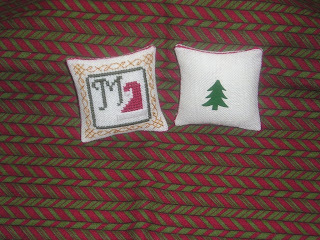 I'll finish them as tiny pillow ornies (they are less than two inches in size) and either bead or use ribbon for the edges. If I do them again, I may play around with where the color changes occur, but for now, the randomness suits me. It turned out a little large for a pillow, so it'll be a small wall hanging. Sadly all the sparkle is lost in my photo. Both of these are my own creations. 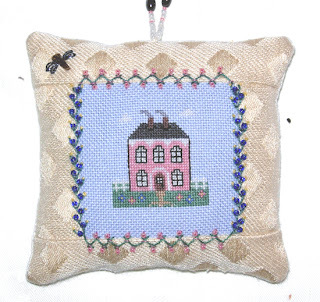 (I have posted patterns on my blog (Cross Stitch for Life). 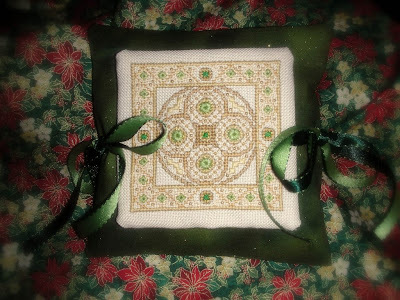 When I read in Focush on Finishing, the Tie-on pillow Class that KarenV gave us, I decided that I wanted a little pillow like that and here it is. I'm glad I'm not the only one finishing up a May ornament in June. 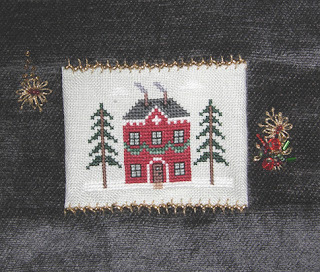 For more information about stitching this piece, click here. Looks like I've fallen a little behind! I was so busy finishing off my Wool Gatherer that I couldn't manage an ornament. So I did it last weekend and here is the result. 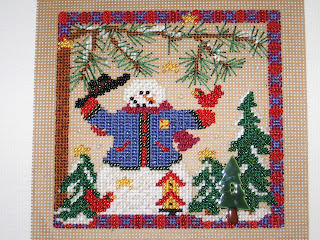 I'm sorry for showing my ornie for april that late...but hopefully you still want to see it :-) It's a design by Prairie Schooler - Santa Collection 1992. So I don't need to worry about what to stitch during the next SAL weekends. I will be busy some time with the 9 letters. This a big job. Adventar Calendar with Prairie Schooler and BOF designs. I stitched little pockets on a prefinished band and then I sewed them on a big piece of fabric.